We’re back. Since arriving at our destination I’ve been a little remiss in keeping this blog up. So here’s an update. 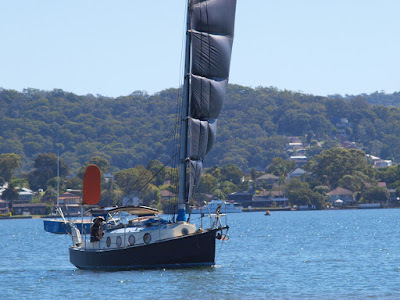 We are settled here on the Central Coast for some time now, we have projects to look forward to, one is a haul out some time this Spring, at one of the boat yards on the Hawkesbury. The paintwork on Ashiki is looking abysmal, it would be nice to make her new again. The torn top panel of the foresail held all the way here from QLD, that's the first project, yet to be carried out, as we’re still daysailing around with it! Arion, a steel 24' "Tom Thumb"
Great news was Raymarine replaced our ST2000+ tiller pilot for new. They saw the quite obvious bad condition of the original and gave up! I’m building a stainless steel trim tab assembly to bolt onto the rudder for the tiller pilot to drive, this should make the TP’s job much easier. Our friend Graham Cox (Arion) has had his TP for 14 years on a similar tonnage boat as Ashiki, connected to a trim tab the whole time and believes for serious use, tiller pilots don’t last connected directly to the tiller. Ours lasted little over 4 months and 2,000 Nm. The big excitement was the Central Coast super storm of April, 2015. It was three days blowing 50 to 75 knots! Fortunately we were (mostly) prepared for it, the forecast was for 60 knots so we moved Ashiki to a bay protected from the Southerly. But the first night with 50 knots gusts we dragged at a rate of 20m/hour. Late at night on a heeling deck I dropped the second anchor, I wanted to let out more rode on the first anchor but that meant winching in 5m to release the snubber, which I wasnt game to do in the rain and darkness. But the second anchor did slow our dragging, which was not a real hazard since it was towards the centre of the bay. The bottom in Brisbane water is soft mud, not the most ideal holding for anchoring and neither of our anchors, 15kg Plough and a 14kg Super Sarca are up to it. I think a next size up and different design anchor (sugar scoop type?) is in our future..
Later that night the dinghy sank, still attached to the boat. We figured its safer under the water than on top. But we lost the oars and a pair of thongs (flip flops to you non aussies). We had quite a restless night, all the while checking Anchor Watch (an app on the phone) to see how much we’ve dragged in the huge gusts. At daybreak, because the rain had stopped I ventured onto the foredeck to winch in the snubber and let out an extra 20m of rode, on both anchors. That would be around 45m of rode in only 4m depth. This stopped the dragging altogether and was fortunate because by mid morning the storm reached its zenith with that 75 knot gust hitting us like a sledge hammer. That’s firmly in category 2 cyclone strength by the way. Ashiki heeled and hunted around, but did not drag an inch further. I made a mental note to build a riding sail next.. (small sail for anchoring, is strung up from the stern is supposed to tame the veering around in a gale). What a difference it makes having the anchors finally holding, the stress poured from us and we both could have a decent sleep. Ashiki was still in the protection of the bay with waves no more than a foot. 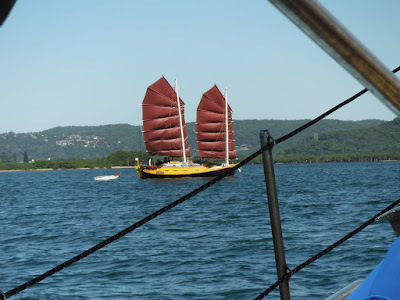 The view of the coastline was different, we were downwind of a mooring field and many of the yachts were having their sails unfurled and flogging themselves to shreads. We had the foresail lowered to the deck, the main resting in it’s lazy jacks were unlashed and it never flogged, even though the luff and leach do hang down. Interesting. Graham on Arion was on a visitor mooring in another bay and saw several boats break free from their moorings and blow past him onto the oyster beds. One large plastic fantastic blew onto him and scraped along his side, his steel boat inflicting more damage on it that on his. On the second night, when the worst of the storm was over (but still 40 to 50 knot gusts) I looked out and was stunned to see the surrounding hills in pitch blackness. The city had lost power, in fact, listening to the radio, land lubbers seemed to be having a rougher time of it than us. No power, trees had fallen everywhere blocking most roads, businesses and work places shut down for a couple days. All the while we were on board with full power, lights on, cooking, surfing the internet etc. Even ran the generator during the blow. The advantages of off the grid living.. 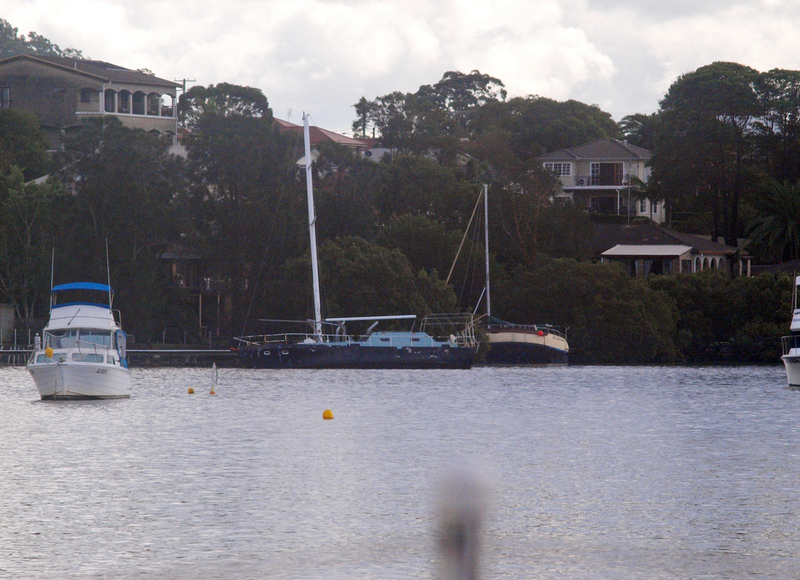 Boats were reported to be all over the foreshore, on parks, on footpaths, it was mayhem. This was their worst storm in 15 years and we happened to arrive in time for it.. Photos of raising, lowering, trimming sails would be awesome!